it's inside you and that's Your Talent Advantage! The Your Talent Advantage Owner's Manual series consists of 5 individual volumes especially developed to help you recognize, claim and use your natural strengths in all aspects of your life. Going through life without consulting Your Talent Advantage Owner's Manual is like trying to build a bicycle with spare parts from a bunch of different sources and without an assembly guide. With enough determination and patience you can create a satisfactory bike - one that will allow you to move from point A to point B while occasionally breaking down. But is that really enough? Think of the time you'll waste in trial and error and of the frustration of almost getting something to work, then having to fix it or worse, start over. Now, think of your career or business. How many false starts have you had - situations where you were unhappy, unproductive and unsuccessful? When you choose your job or started your business, did you take into account your natural strengths and skills to ensure that what you were setting out to do was supported by your talents? Life is way too important to leave to chance or to settle for less than what you really deserve. So don't! With the Your Talent Advantage Owner's Manual you'll have immediate access to the information you need to live your life on purpose, achieving the success and happiness you dream of! Volume 1: Celebrate You is focused, well, on you! It provides incredible insights about specific aspects of the way you experience the world and the innate strengths you possess as the result. More than helping you understand your comprehensive view of the world and your part in it, it's full of practical application tips and exercises to help you make the information provided REAL for you. Volume 1 is about your Perceptual Style - the way you take in information and observation and make it all meaningful to you. 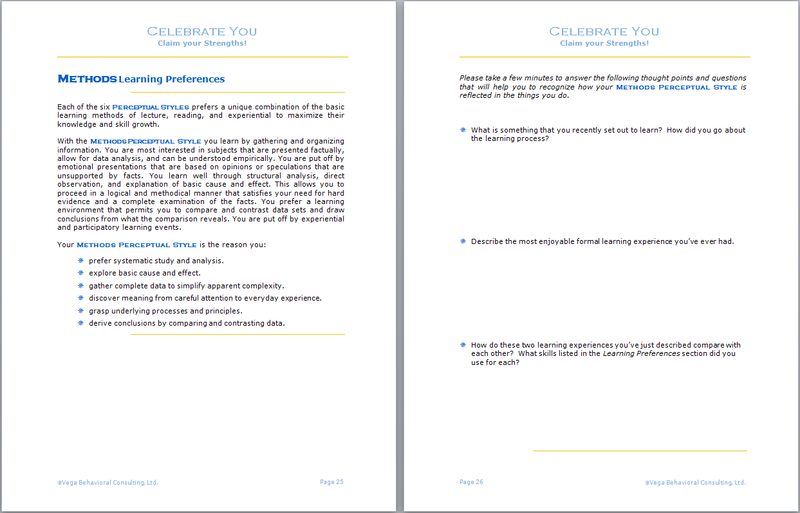 Based on a revolutionary psychological theory that teaches people how to unleash their deepest potentials for success and tested by over 30 years of coaching, Volume 1: Celebrate You provides you with an in-depth assessment specifically designed to identify how you see and experience the world and what your natural strengths are. Unlike other assessments that measure social behavior or personality traits, our Perceptual Style assessment identifies the skills and strengths that are innately yours in all aspects of your life! "What I love about Perceptual Styles is the way my unique talents got so much bigger in my own eyes as I began to understand my style and make intentional choices about how I use it. Before I took the assessment, I had been discounting a lot of the things that other people value about me, simply because they're easy for me. I thought that meant everyone could do those things, and it was a huge revelation to me that most people can't do what seems easy and natural for me! If you're wondering how to end your day with three times the energy you're used to having, start with the Perceptual Style Assessment -- and learn how to design your life around the things that are as easy to do as breathing!" While the science behind this assessment is sophisticated (click here to read all about it), taking it is simple. The assessment questions are neutral and noninvasive: you’ll be asked to rate which adjectives you most identify with, creating a highly accurate psychological portrait. The Internet-based assessment takes 30-40 minutes, and if you are interrupted, you can save your answers and continue at a later time. And best of all, you’ll receive your results - Volume 1: Celebrate You - almost immediately after you submit your assessment. "The Perceptual Style Assessment told me more about myself in the first few minutes of seeing the results, than many of the other assessment tools out there. I really like how it brings together skills and perceptual style so quickly. In one easy snapshot you can see who you are, where you're at and immediately get a handle on new directions that are best for you! I highly recommend it!" Think of the possibilities of what you can accomplish when you have a clear understanding of why your career or business is stalled, why people around you sometimes don't "get it", why you aren't getting as much accomplished as you thought you would AND you have practical actions you can take immediately to solve those issues! Our revolutionary Perceptual Style Assessment that reveals how you experience the world around you and how your interpretation of events and ideas directly influences your natural strengths and skills. Your personal results filled with descriptions and details about your specific natural skills and strengths - including quick practical application tips and exercises so you can put your results to work for you right away. Why wait another minute wandering through life without the information you need to live the life you deserve? Order Volume 1: Celebrate You TODAY!